The xanthophyll cycle is a relatively simple process whereby the interconversion of violaxanthin into zeaxanthin in the light harvesting complexes serves to regulate light harvesting and subsequent energy dissipation in different light environments. In order to determine how these carotenoids can regulate such processes it is first important to ascertain what differences exist between these two xanthophylls. Deepoxidation brings about significant changes in the structures and hence the properties of these carotenoids. Thus when the conjugated chain length is increased from nine to eleven conjugated double bonds this in turn affects their S1 energies but also alters the molecule’s sizeandshape. The ‘Molecular Gear Shift Model’ describes the direct quenching of chlorophyll fluorescence by singlet-singlet energy transfer to zeaxanthin, while violaxanthin can only act to transfer its energy to chlorophyll. However this model does not account for the ability of these molecules to profoundly affect structure and organization of light harvesting complexes. 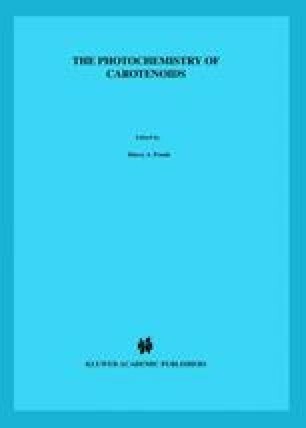 Differences in carotenoid structure affect their interactions with the complexes so that violaxanthin and zeaxanthin play an important role in determining their structure and function by controlling its inter-subunit structure. In the presence of violaxanthin, complexes are optimized for light utilization and are resistant to ΔpH-dependent quenching. De-epoxidation into zeaxanthin allows a different state to be formed in which ΔpH formation readily triggers conversion to a strongly quenched state in which sub-unit interactions are increase.